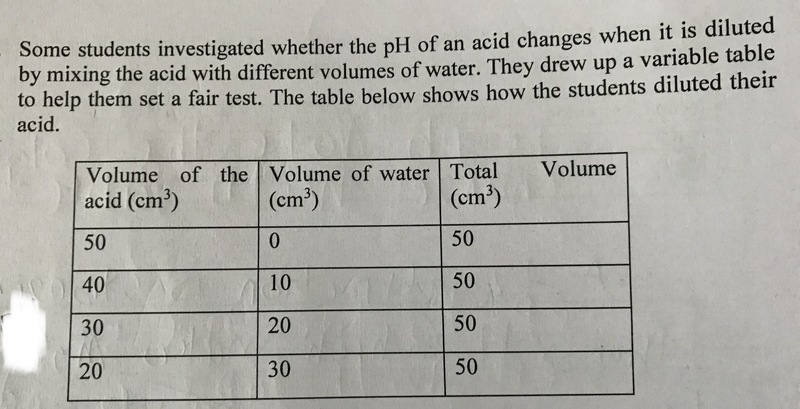 How does pH value change with dilution for the question shown in the picture? I expect the pH value to increase with dilution. Is there any case where the value remains same with dilution? You were correct in stating that the pH value would increase with dilution, though this explanation is incomplete. To understand why you must understand what pH actually is. In simple terms, pH is a scale based on the concentration of H+ ions in a volume of a solution. As you likely know, the higher the number, the higher the basicity; the lower the number, the higher the acidity; with pure water being exactly 7 in the middle of the scale. This is where the issue arises. Yes, diluting the acid with pure water would decrease the concentration of H+ in the solution and therefore increase the pH, but only until it approaches 7, the pH of water. It is possible to go higher than that by adding bases, but pure water is specifically mentioned in the question, so that does not apply here. As for your last question, I do not believe that any acids are "immune" to dilution, as one can always add more water to decrease concentration, and therefore increase pH (to 7). How does diluting an acid change pH?